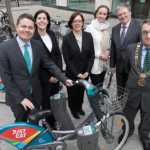 Dublin’s Lord Mayor Mícheál Mac Donncha today officially opened Dublin city’s newest Just Eat dublinbikes station in George’s Lane, Smithfield, Dublin 7. He was joined at the launch by Paschal Donohoe, Minister for Finance and Public Expenditure and Reform, Anne Graham, Chief Executive Officer, National Transport Authority, Richard Shakespeare, Assistant Chief Executive, Dublin City Council, Amanda Roche-Kelly, Managing Director, Just Eat Ireland and Joanne Grant Managing Director JCDecaux Ireland. The expansion of the scheme will increase the number of Just Eat dublinbikes stations in the city to 116 (from 101) and the number of bikes to 1,600 (from 1,500). In addition to George’s Lane, bikes will also be available to annual members and short term subscribers from 3.30pm today (27th March 2018) in the vicinity of the Grangegorman campus with three stations opening around Grangegorman Lower. These are at St Brendan’s Way (South), the Clock Tower (Central) and Ivy Avenue (North). The Just Eat dublinbikes scheme is one of the most successful public bike share schemes in the world and is set to grow even further with the addition of these new stations. Figures published in February 2018 show there are 67,890 long term members of the scheme and since launching in 2009 there have been 22,417,162 journeys. 96% of all journeys taken are completely free and the average journey time for users is just 14 minutes. Photos will be syndicated to picture desks by Naoise Culhane Photography. 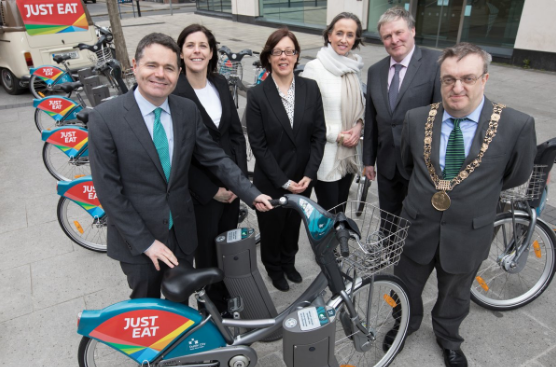 The Just Eat dublinbikes scheme is a public bike hire scheme operated by JCDecaux Ireland on behalf of Dublin City Council. Launched in September 2009, the scheme consists of 101 stations and 1,500 bikes. The Grangegorman expansion will see 15 new stations and 100 new bikes added to the network over the coming months. The expanded bike scheme will provide for improved linkages between Grangegorman and the city centre and will greatly benefit residents, workers and students at the Grangegorman Campus. This expansion is facilitated by a €1.2 million sustainable transport grant from the National Transport Authority (NTA). This follows the €5.2 million provided by the Authority towards a 57 station Phase 2 expansion over 2013-2014. The funding provided allows for the construction of 15 new stations, the majority of which will service Grangegorman and the surrounding local area with additional capacity provided in other areas of the existing network. Operational costs are supported through memberships and sponsorship of the scheme by Just Eat Ireland. Just Eat plc operates a global online marketplace for food ordering and delivery. Based in London, Just Eat uses proprietary technology to provide a fast and efficient service to 19.6 million customers and 78,700 Restaurant Partners worldwide. Just Eat is a member of the FTSE 100 index. In Ireland, Just Eat has over 2,100 takeaway restaurants online and consumers can access their favourite local eateries for lunchtime and evening options with a choice of over 40 cuisines. Over 80% of customers order either via the app or on mobile device and the Just Eat app has been downloaded over one million times. JCDecaux Ireland is a subsidiary of JCDecaux the world’s largest Out Of Home Media company. Providing a real complement to public transport, JCDecaux’s bikes improve the quality of city life and optimise travel options, in line with current environmental and public health targets.